LiveOps has been innovating inside the Call Center software space for over 14 years. It realized early on that connecting with customers was evolving into a more social experience. For this reason they designed their system such that it could interact with consumers through traditional voice, email, chat, SMS and social media. With over 50,000 users and 3 billion interactions, it is clear that customers have been receptive to this software. There is little doubt that cloud based technologies empower businesses, and this is especially true if the IT resources at your company are minimal. As communication endeavors now fall in this category, hosted services like those from LiveOps make a significant impact on customer engagement. The LiveOps family of services enable businesses to run a high-powered call center solution, with various applications designed for different forms of communication. The service is modular in design allowing customers to only pay for what it needs or an all-inclusive package may be utilized to take full advantage of the platform. The company is among several providers taking advantage of WebRTC technology as a core component in the platform and it is used to build what is effectively the foundation service, known as LiveOps Voice. This is then packaged with modern call center technologies like intelligent call routing, a drag and drop call queue, call recording for both voice and on screen interactions, plus many others. A customer can use this for either inbound customer service centers to field calls, outbound calling departments for sales or a mix between the two, depending on its needs. Another useful module offered by the company is LiveOps Chat that aggregates a variety of different text-based communication technologies into one interface. This application has the capability to interact with a user via a two-way chat, email, social media, email and voice. All interactions are archived which is useful for both resolving disputes as well as coaching associates. Also available is LiveOps Email and LiveOps social. The email portion is designed to parse inbound emails to effectively distribute messages to the appropriate agent or group. The outbound function provides functions for marketing campaigns and blends with SMS to increase reach. The social function integrates with Facebook and Twitter, allowing a single view for agents to field incoming posts and messages. Unlike many other solutions in the market, it is possible to respond from within the platform rather than simply viewing the information. Each of these products comes at a different level of service, starting with Basic at a disclosed price point. All fees are based on a per user, per month model. The Voice service is $95, Chat is $40, Email is $30 and SMS, Facebook and Twitter are each $20 individually. All can be bundled together for $195 which saves around $30 if all were to be purchased separately. The Professional and Enterprise levels of service require a quote to generate a price but come with added features such as the Authoring tool that allows development of a more integrated call flow and basic call recording. Each level of service has the capability of directly integrating with CRM systems for greater visibility of customer information. Currently, it is possible to merge accounts with Microsoft Dynamics, Salesforce, SugarCRM and several others into the LiveOps family of communication products. Though this is possible when starting with the basic service, it will be necessary to contact a sales representative for customized pricing. One interesting element to LiveOps is the number of contractors they hire to work as call center agents. Essentially, those looking for part time work can apply for a position to work as an agent from home on their own time. This also ties into the company’s environmental ethos (called LiveOps Green) that aims to reduce the use of non-renewable resources and lower carbon emissions. LiveOps appears to take support seriously for their existing customers. Even basic support is impressive, promising response within 2 to 4 hours. Beyond this, you can pay for escalated support. A 15% price adder gives you 24/7 support and a 1 hour response time. A 20% adder gets you the full white glove experience, including your own technical account manager. The software appears to be relatively intuitive to use and does a good job at grouping customer information together in one place to improve efficiency and productivity for agents (see example below for an agent interaction with a customer). The LiveOps family of products offers very useful tools for creating a powerful datacenter but potential consumers may end up with as many questions as answers after viewing the company’s product portfolio online. Pricing starts off with a clear-cut, per user model, per month, for the Basic tier of service but it ultimately becomes a much more convoluted system, requiring a consultation from a sales representative. In terms of market standards, pricing is quite high, even for the Basic plan. The voice plan alone is similar priced to what many competitors charge for their entire family of services. Customers are also required to pay extra at any level of service to order to integrate with their CRM systems, which is arguably one of the best benefits for any call center software. We contacted customer service via email, as the live chat feature was unavailable at the time, and received a call back a couple of hours later. The original question was whether or not domestic calling to the US and Canada was included or if this would incur additional costs. The representative never actually answered the question and instead replied with several other questions as to the nature of the business needing their call center solution. The individual stated she could not answer the question and indicated contact info would be passed along to a marketing professional who would call later, but never did. Admittedly, this is a small sample size of interactions with customer service but I was a little disappointed, especially since LiveOps is in the customer service business. This may be considerably better if you are an existing customer. Full, web-based, call center software starting at $195 per month per user or less, if selecting modules ala carte. Integration with popular CRM systems like Salesforce, Zoho CRM, Zendesk, Microsoft Dynamics, SugarCRM and others possible at additional expense. Analytics engine known as LiveOps Insight included, starting with the Basic plan, for reporting as well as live tools for listening to calls and providing immediate feedback to agents. Difficult to find clear pricing for most of the services. The entire package is somewhat expensive. The Social tool provides a unique and powerful system for utilizing Facebook and Twitter that enable an agent to respond directly from within the LiveOps system. 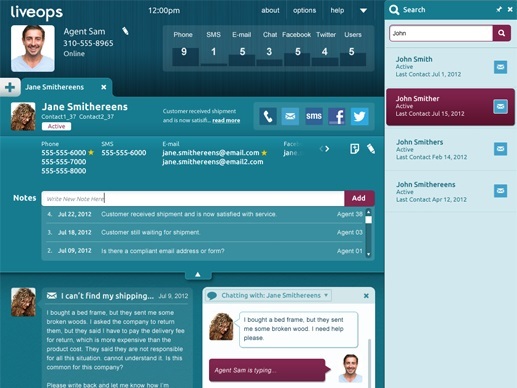 The LiveOps platform has a great arsenal of tools to create a modern call center solution. A customer can take advantage of every tool in the family of products or opt to use certain modules. The service is likely best suited for a mid-sized to larger business with a decent budget for communications as it is slightly pricey compared to market standards. Though some shy away from the "contact for price" model, this can actually work to the customer's benefit by negotiating a set of services and price point rather than a cut and dry model. LiveOps reviews are listed in chronological order. We have over 20 agents using Liveops software. Although it is expensive, it is one of the few solutions we found that enabled our call center to talk to customers through live chat, social and by phone. Also everything is stored for tracking purposes.